China orbited a military communications satellite Wednesday on a Long March rocket, continuing the country's busiest year of space launches since the Chinese space program dawned more than four decades ago. The Long March 3A rocket launched at 1609 GMT (11:09 a.m. EST) Wednesday from the Xichang space base in southwestern China's Sichuan province. It was just after midnight Thursday morning at the launch site. The 172-foot-tall rocket delivered the Zhongxing 20A communications satellite to a geosynchronous transfer orbit stretching from a low point of 125 miles to a high point of 26,000 miles, according to tracking data. The satellite will use an on-board propulsion system to reach a near-circular orbit about 22,300 miles above Earth. Zhongxing 20A, also known as Chinasat 20A, is believed to be a Chinese military communications satellite. Official state-owned media reported the spacecraft would help improve the country's radio and television broadcasts. But the satellite likely provides secure communications coverage for Chinese ground forces. The spacecraft is based on the DFH-3 satellite bus from the China Academy of Space Technology. It likely weighed about 5,000 pounds fully fueled at liftoff. 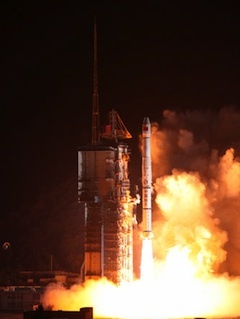 The flight was the 14th successful Chinese space launch this year, setting a new mark for the country's launch industry. Before 2010, China had launched no more than 11 rockets into orbit in a single year.